We’re so happy to be hosting Malia Zaidi’s A POISONOUS JOURNEY BOOK BLAST at The Writer's Life today! Please leave a comment to let her know you stopped by! The year is 1925, a time that hovers between two catastrophic wars, a time of jazz and sparkle, and a time of peace and reflection. For Lady Evelyn, struggling to outrun the ghosts of her tragic past, it is a time of transformation. Left orphaned after a fire when she was only four, Lady Evelyn Carlisle was raised in London by her stern aunt and uncle. Now, twenty years later she has grown restless and is keen to escape her chaperone's grasp. A letter from her cousin, Briony, living with her husband on Crete, comes at just the right time. Packing what she can, Lady Evelyn makes off for foreign shores. Welcoming her are not only Briony and her husband, Jeffrey, but also his handsome and mysterious friends, Caspar Ballantine and Daniel Harper. Though the latter carries with him tragic memories of the Great War, Evelyn is glad to be in their company. 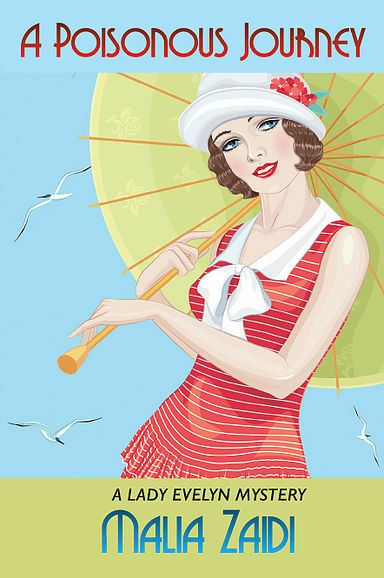 With the sun warming her back and the dazzling sea in her sights, this fresh start seems destined for happy days ahead. Little does she know . . . What starts off as a sunny holiday quickly turns into a sinister nightmare, when Evelyn stumbles across the corpse of one of her cousin's houseguests. Drawn into the mystery surrounding the murder, Evelyn embarks on a mission to discover the truth, forcing her to face her own past as well as a cold-hearted killer. With the help of her cousin, the handsome local police detective, and the mysterious Daniel Harper, will she uncover the truth, before another life is claimed? A chill ran down his spine and goose-bumps prickled his skin as the cold darkness enveloped him, swallowed him, the realm of Hades tormentingly near. He sucked in a breath of the damp air and blinked furiously, anxious to find his bearings, to discern hard rocky wall from empty space. It was his fault, he had dropped the torch and they had no choice but to save the reserve for later. For their destination. He would manage. He knew the way. “Andros?” The nervous voice caught him almost unaware. Andros, Dros, Dros…the echo bounced off the walls around him and made him feel dizzy for a moment, as though the walls were moving closer and caging him in. He exhaled, trying to steady himself. They just had to follow the plan. He was good at that. Good at being patient, good at doing what he was told, at following directions to the letter. “It’s all right,” he tried to sound calm, quelling his fear as it mingled with the excitement that bubbled inside him, ready to explode. They were so close now. He could feel the rhythmic beat of his heart increasing, a nervous echo in his chest. “Stay where you are, your eyes will adjust. Have patience.” Listening for a moment, he became aware of the labored breathing of his brother close behind. He stood still for another moment, no other sounds dared to intrude, eerie silence, thick with mystery, with secrets to be uncovered swathed them in its heavy shroud. The Sirens are calling, only you can hear. Run for safety, or plunge and fall prey to temptation. His eyes began to adjust, slowly deciphering the jagged outline of a rocky outcrop above him. It was close. He could feel it. His muscles tensed, stiff and solid, waves of energy pulsing through him, barely contained anticipation. Despite the cold, he felt beads of sweat dotting his brow and running down his temples. “Andros? I think I see you. Yes.” A few unsure steps followed these words, and he saw the shadowy outline of his younger brother, warily moving toward him. Slowly, with his hands carefully outstretched, he felt his way forward. The air was growing stale, thick and cloying with dust and age. Breath was quickening, he shivered. So close now. Everything would change. For a split, indulgent second, he allowed himself a fantasy of the glory that would come, of the life that awaited him. Yes, not much further now. His feet, clad only in his worn leather shoes felt every rock on the uneven ground, a sensation that gave him comfort, a feeling of awareness that had replaced his compromised eyesight and heightened his sense of touch. Hands extended, he reached into the blackness like a blind man. Suddenly they came up against something. Wall. Hard rock wall. The tunnel had come to an abrupt end. Andros frowned, small creases folding his forehead, his brother’s voice behind him a distracting intrusion. “No,” he answered carefully, unconsciously holding his breath. He ran his hands along the roughness of the stony wall, seemingly solid and impenetrable, until… Yes, a smooth oval protrusion in the rock face. Sucking in a nervous lungful of dusty air, he pushed. The oval receded into the wall with neat precision. A momentary silence. Then, as if by some miraculous force, the wall gave way, an ingenious mechanism. A dense cloud of dust and debris rose up, sending both men staggering backward, coughing, and rubbing their stinging eyes. Soon the dust settled and silence was again upon them. Neither spoke, fear and excitement taking hold of them. Andros swallowed. It was all coming together. They were here, finally. “The torch, now.” His voice was almost a whisper, thick with anticipation. A hiss, and a flicker of orange light shot out of the darkness, illuminating his brother's dirty face. Reluctantly the younger man handed it over. No words were exchanged as Andros took the first careful step, holding the glowing light before him. He entered the chamber, eyes wide, barely breathing. He had found it! He wanted to shout out in joy, in relief. He had known all along, he had found it. Andros turned, sensing something strange in his brother's tone. The younger man's face was still cast in shadow, save for the glittering eyes, shining in the gloom like those of an animal. “Yes, this is it,” he turned around again, taking it in, the glory. His glory. A sudden coldness at his neck startled him, a stab of pain. And then the blackness returned. Endless and unrelenting. 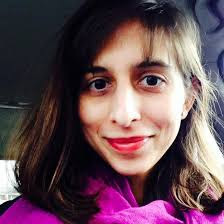 Malia Zaidi is the author of A POISONOUS JOURNEY. She attended the University of Pittsburgh, and studied at English at Oxford University. Having grown up in Germany, she currently lives in Washington DC, though through her love of reading, she resides, vicariously in countries throughout the world. 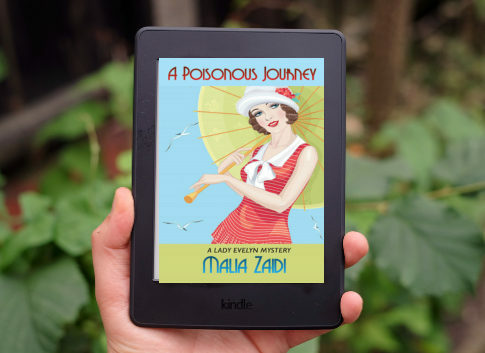 A POISONOUS JOURNEY is her first book in the Lady Evelyn mysteries series. The sequel, A DARKER SHORE will be available later this year.